Craftsman 4 Piece Pliers Set: Quality Tools From a Trusted Name Whether you are a professional, home or hobby worker, this 4 pc pliers set gives you what every good tool kit needs: options. 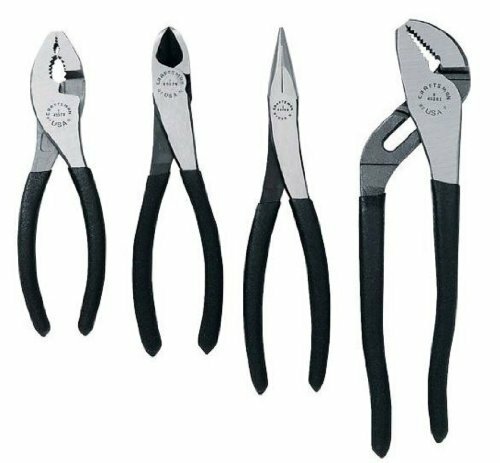 Built super tough, with features not found in cheaper sets, these pliers will hold up under use or abuse. Made in USA. Included are: 7 in. diagonal pliers, 8 in. long-nose pliers, 6-3/4 in. slip-joint pliers and 9-1/2 arc joint pliers. Each piece comes with a silver finish and coated handles that provide a good grip so they are less likely to slip out of your hand or bruise your knuckles. You can rely on Craftsman's famous Lifetime Warranty.